(Laserlight) 12 Tracks - Rare German pressing, reissue of the original 1967 Dot Records album. 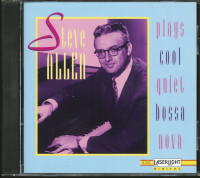 The Guinness Book of World Records has listed Steve Allen as the most prolific composer of modern times, and small wonder given that as of early 1993 Allen had created over 4600 numbers, including the 12 lush ballads featured in this collection. Perhaps the most unusual item in the present collection is "Tango Moon," which, despite its rich, harmonic sophistication, was written by Allen when he was only 18 years old, by which time he had been actively composing for some six years. 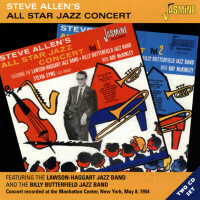 The theme from "A Man Called Dagger" reflects Allen's initial experience at scoring for motion pictures. Fans of the original "Tonight" show, which Allen created/hosted, will recognize the program's closing theme song, "Tonight," soulfully played by alto-saxophonist Bud Shank. 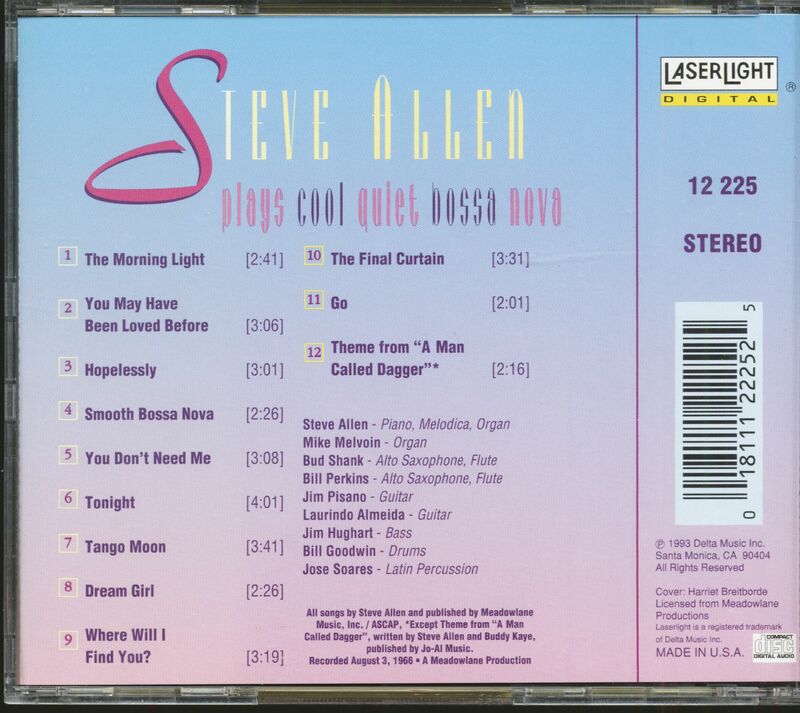 Among the stars who have recorded Allen's songs are: Bing Crosby, Louis Armstrong, Count Basie, Perry Como, Sammy Davis, Jr., Ella Fitzgerald, Aretha Franklin, Judy Garland, Steve Lawrence and Eydie Gorme, Peggy Lee, Mel Torme, and Joe Williams. Although Allen has written hundreds of numbers in the jazz category, and a formidable amount of comic novelties, it's always been clear that his specialty is the romantic ballad. 09 Where Will I Find You? 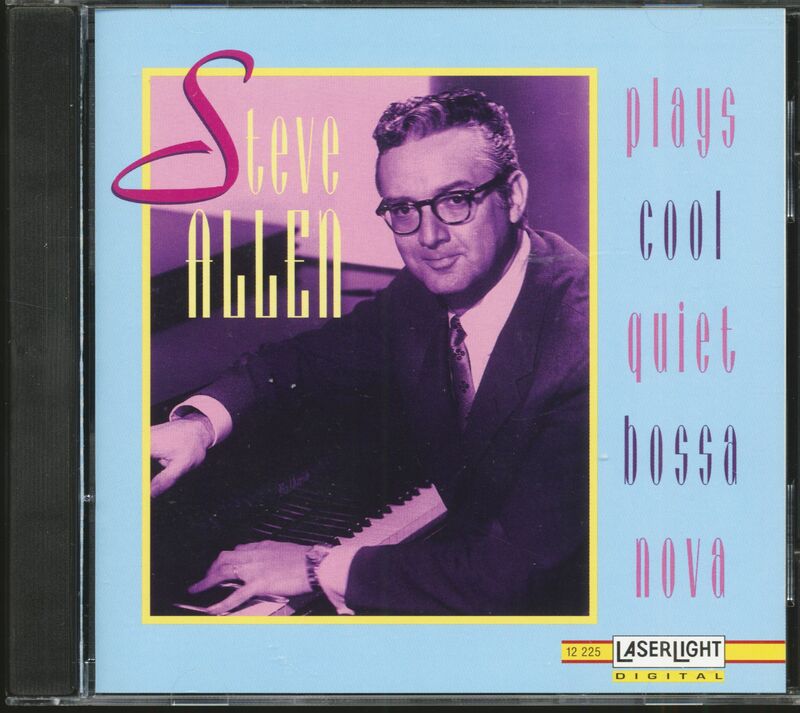 Customer evaluation for "Steve Allen Plays Cool, Quiet Bossa Nova (CD)"